Hello my friends this day has taken me along time to get here. Some of you would be shocked to know I have never had my own room. I am not complaining since that means I have been lucky to have shared my room with my sister and then my husband. Speaking of my Prince Charming, he has been incredible working toward a day when I would have my own room to create. The room I used before as a creative space was in the basement. 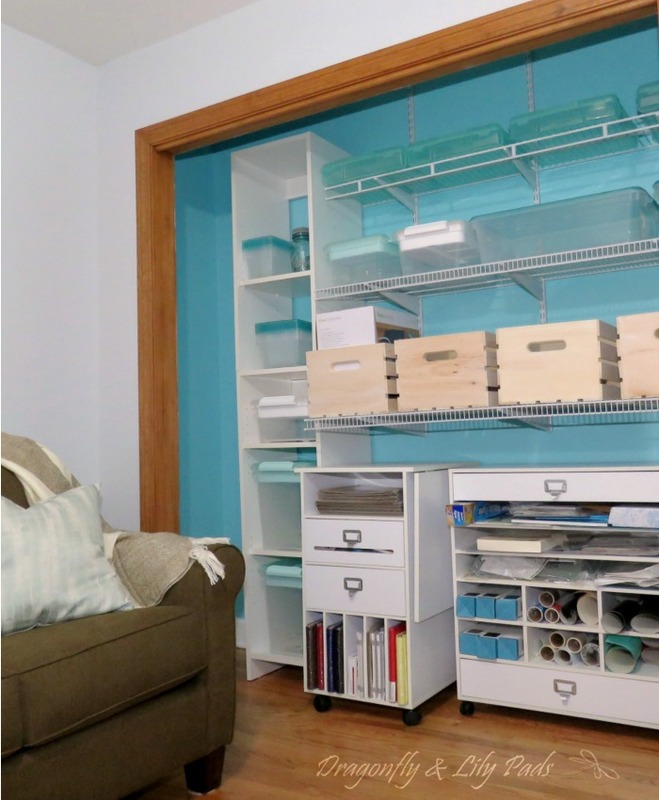 I tried so hard to dress up one wall, a counter and decorated the space with most of the storage items in my new craft room. 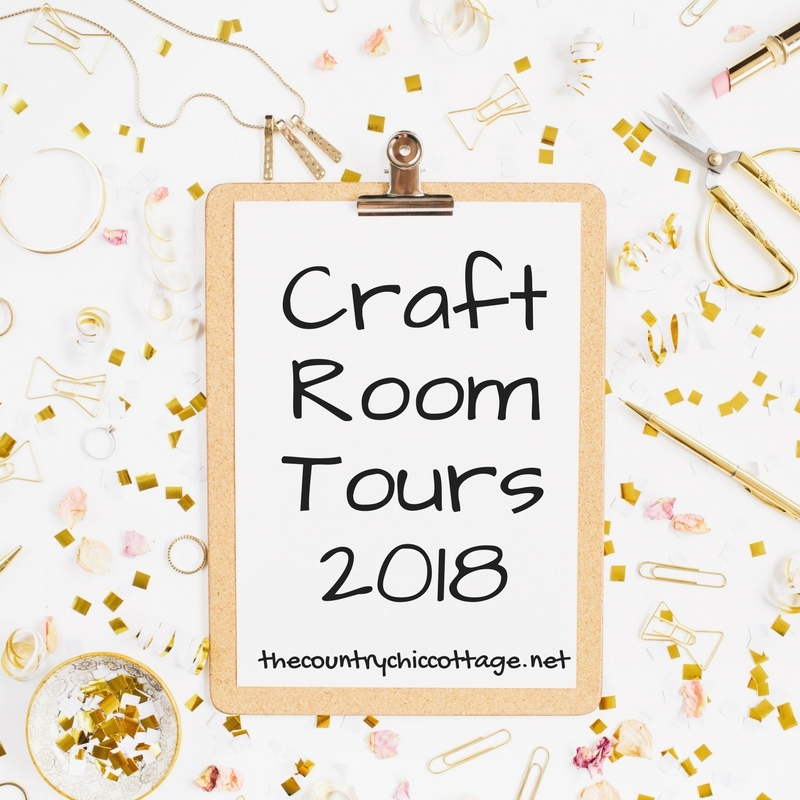 Angie from Country Chic Cottage gathered several amazing bloggers to share their Craft Room Tours this week. 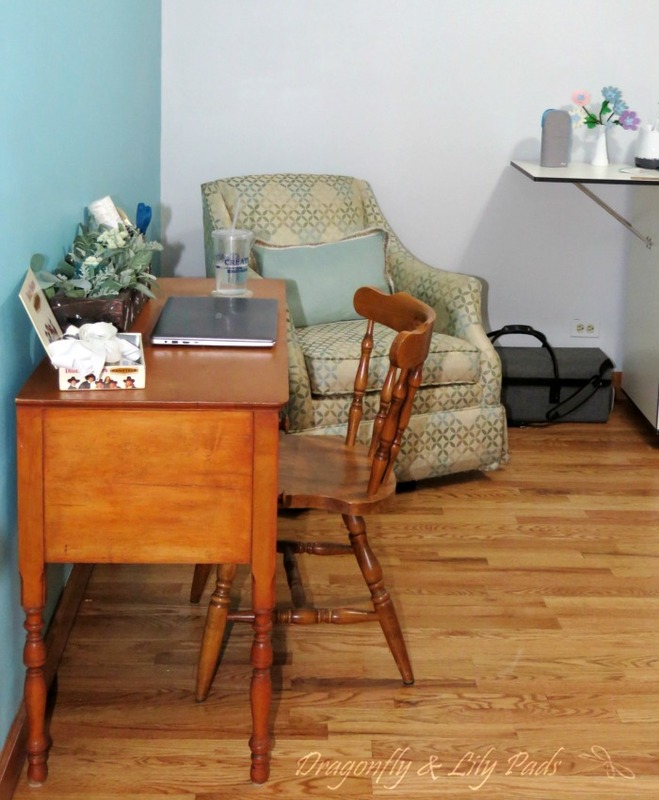 Be sure to check them all out as you will find even the smallest or biggest rooms have the most creative ideas. There is a link at the bottom of my post so head over there ASAP. The first project we tackled once we could get in the room was the closet after painting. The room before was my son A's room. Since he married a beautiful lady who is now my daughter-in-law technically but to me she is our first girl. We are so blessed to have a growing family with another wedding and our second daughter later this year. Opps! Back to the post. 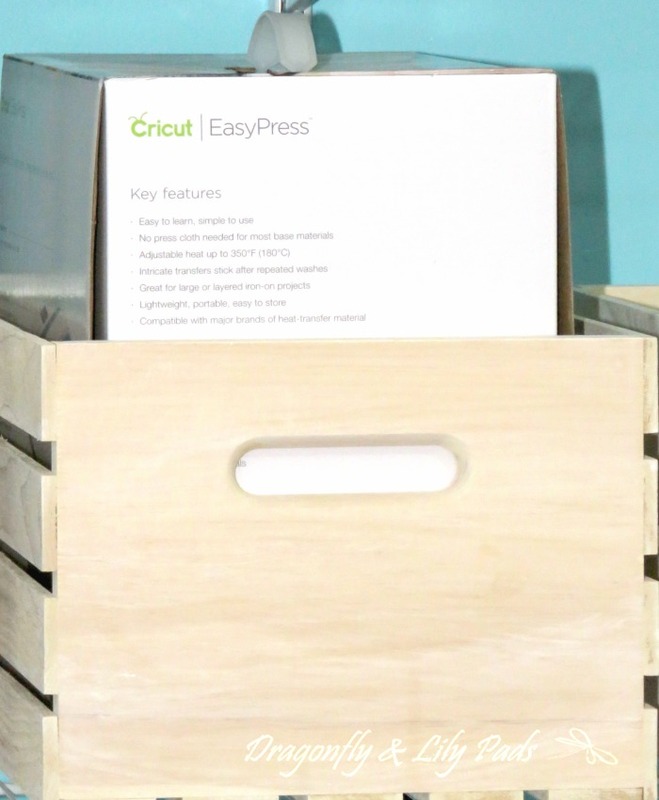 This is how I have been using my Cricut Maker and creating all my projects for the past few months. We added seven feet to our house when the boys were in middle school and set up to continue the wood floor through our 1940's house at the time of construction. When the builders put down the subfloor we had them add two layers of 3/4" tongue and groove plywood to the new addition side of the room. At the last minute our terrific floor guy was able to squeeze in our job. Hooray! 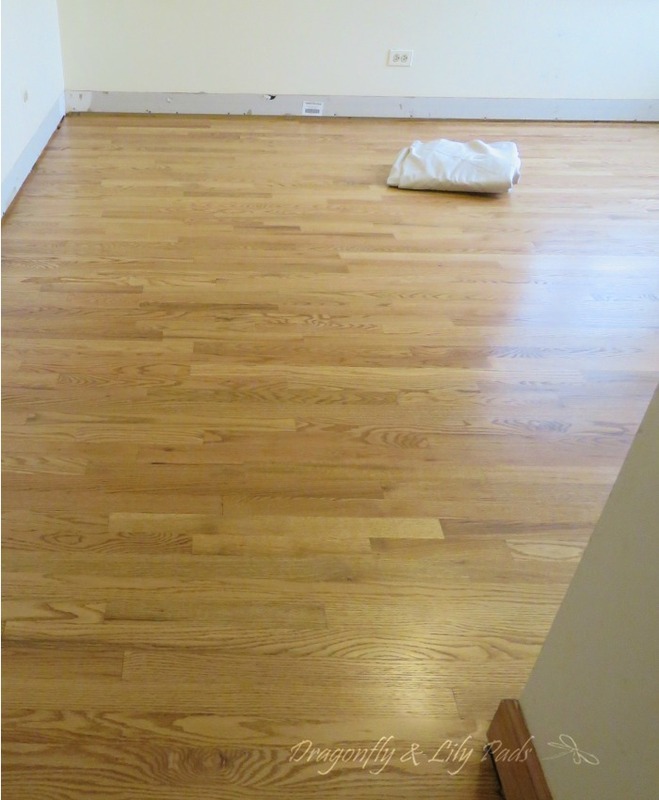 Starting with new oak hardwood floors is what I call a clean slate! 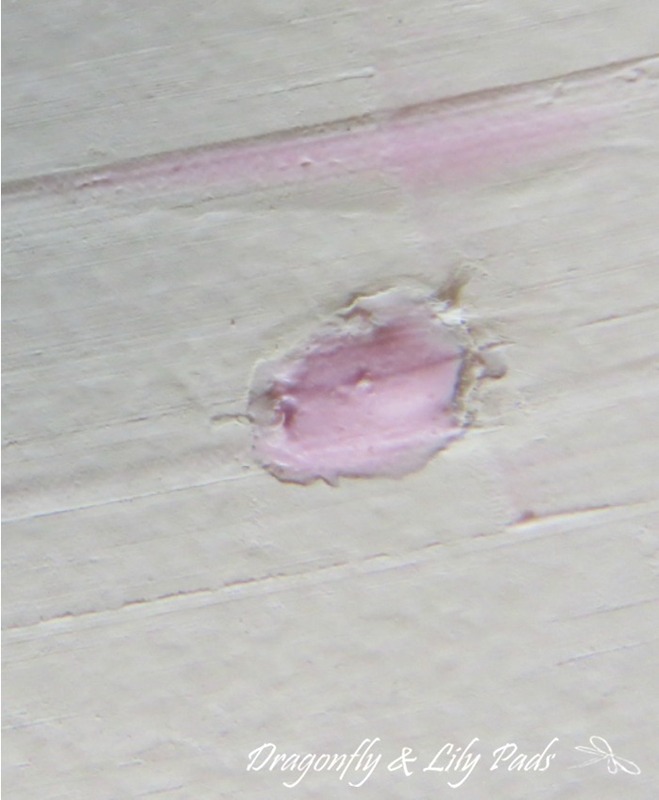 Patching the walls with Dapp makes it easy to see your work as well as when it dries white. 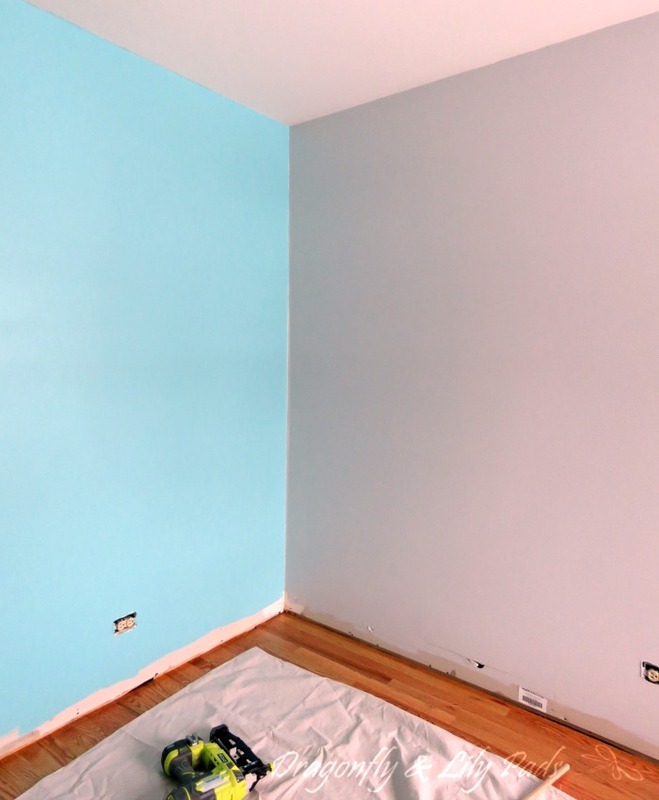 I absolutely love this color we chose for the accent wall called Big Surf. The main color is Evening White on the three remaining walls. Both are Behr Marquee one coat coverage paint. This is always my favorite part of remodeling a space. Building the closet will be the base for how the craft room functions. 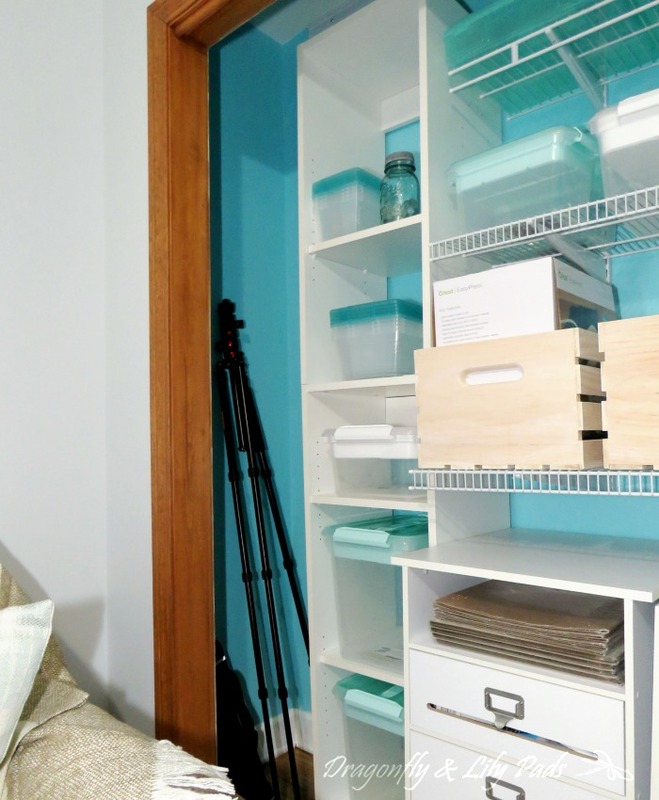 I'll tell you more about the closet systems in a later post. OMG! 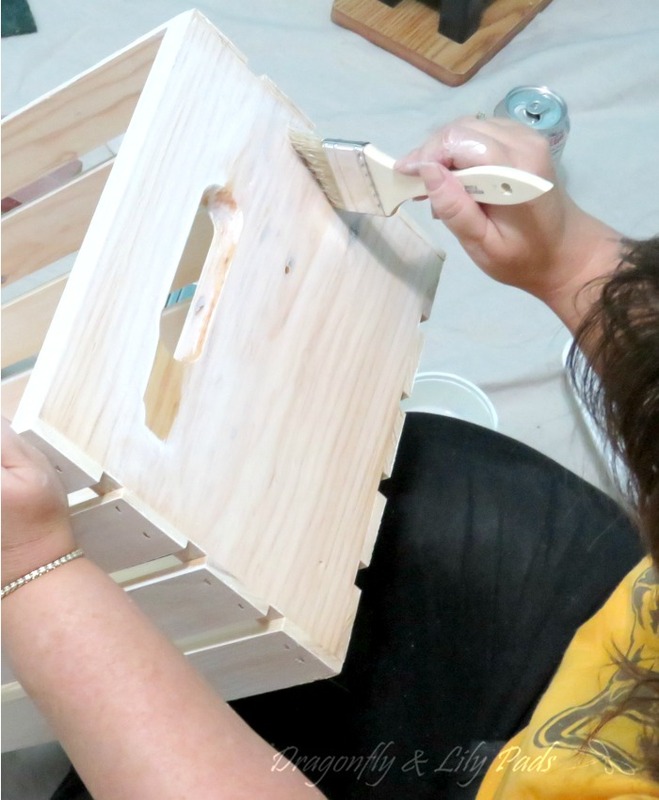 I am quite a mess by now as I am white washing these wooden crates for base shelf. Prince Charming was laughing when I was helping him with the new light fixture because I had Big Surf paint in my hair. Blue hair Don't Care? These rolling carts of storage by Recollections were in the basement as different surfaces to work on as well. Look how much room I have. I am so excited a few times my eyes welled up with tears of joy. 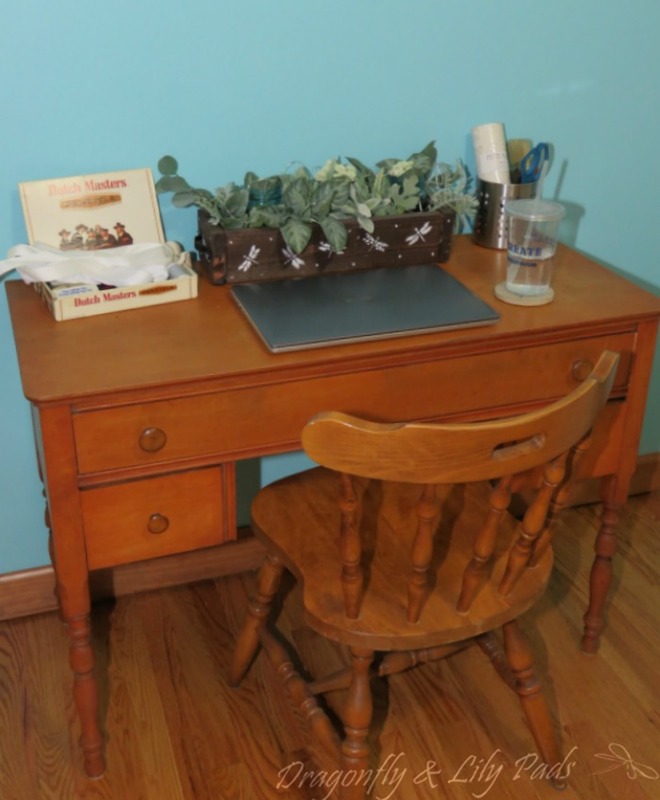 This side of the room hosts my desk bought at an antique store in Michigan. My Grandma's kitchen chair is my desk chair which is perfect since I inherited my creative side from her. 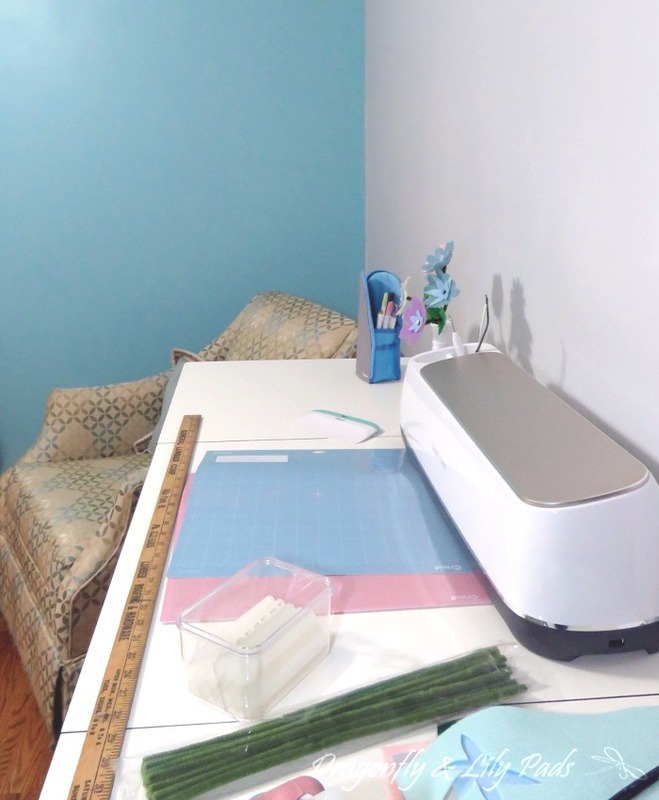 Of course my Cricut Maker has a new place with lots of counters. The top of this cabinet has a ironing pad too. This will be fabulous when I am using the Heat Press or pressing seams when sewing. 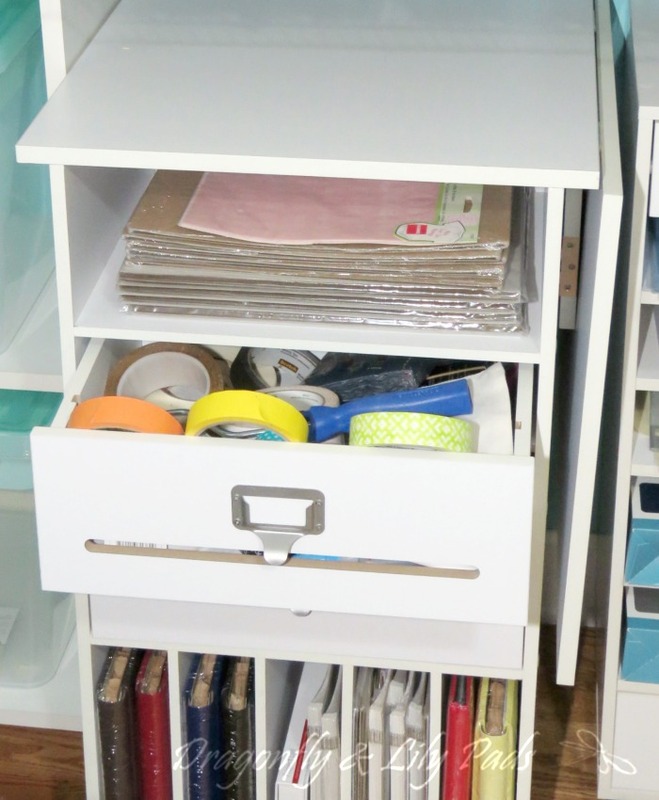 My sewing machine is stored in the cabinet below. 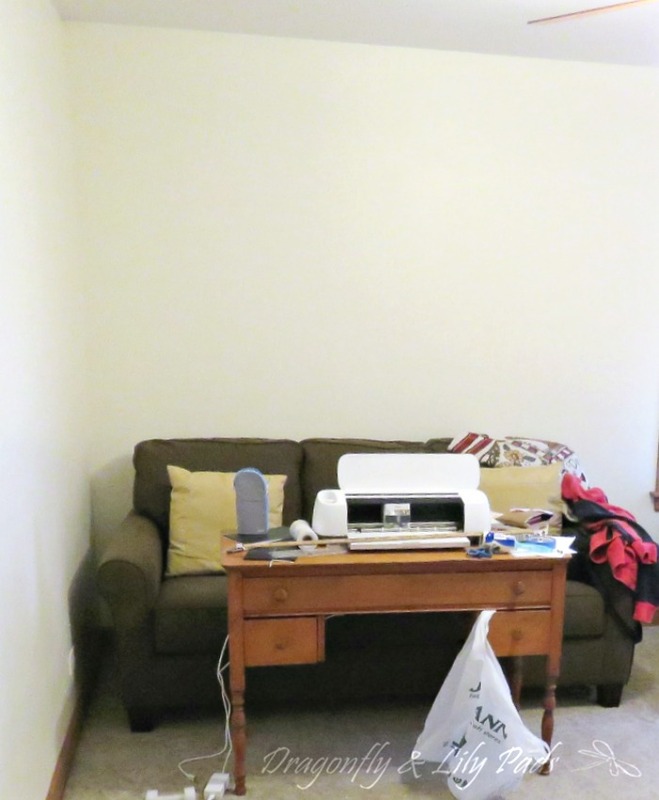 My Cricut carry bag is tucked neatly by the wall on the floor. 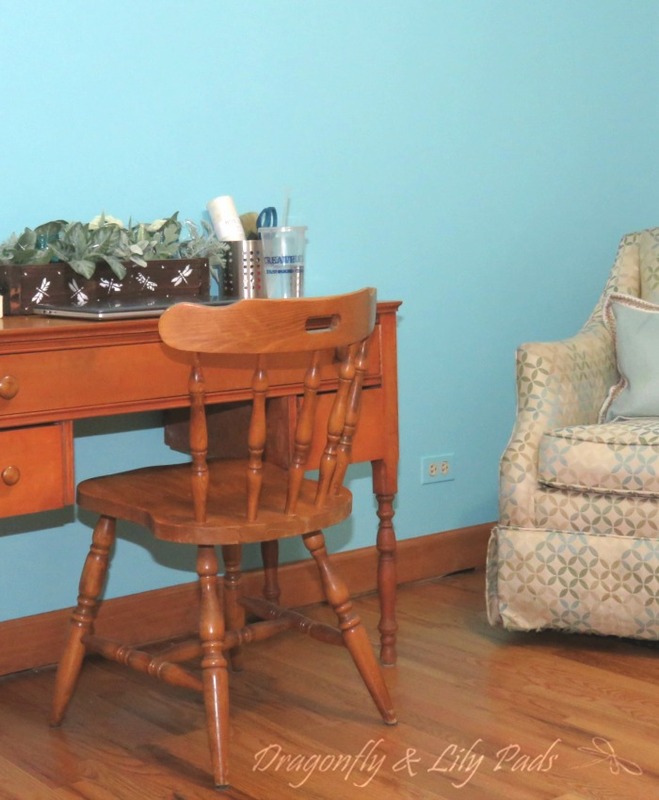 I love a comfy chair to plan, learn or do hand sewing. This swivel, rocking upholstered gem was found at a furniture warehouse sale for $ 99. 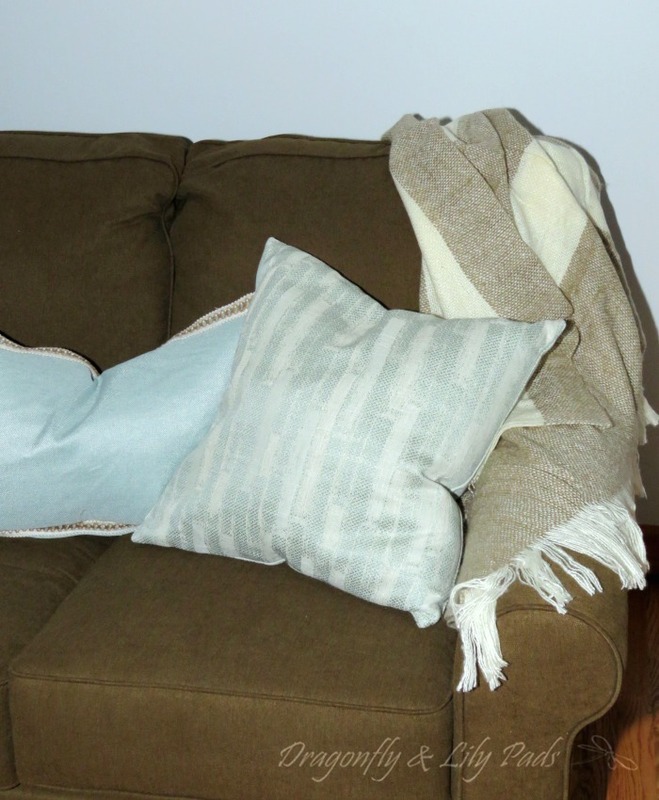 Pillows and a blanket for an occasional nap add color splashed across the room make for a cozy feeling plus keep this room dual purpose for our guests to have a place in our home. A cigar box reminds me of my grandpa while gathering scissors and ribbon. My BFF made me the darling planter box filled with mason jars including fairy lights fill a special place on my desk. 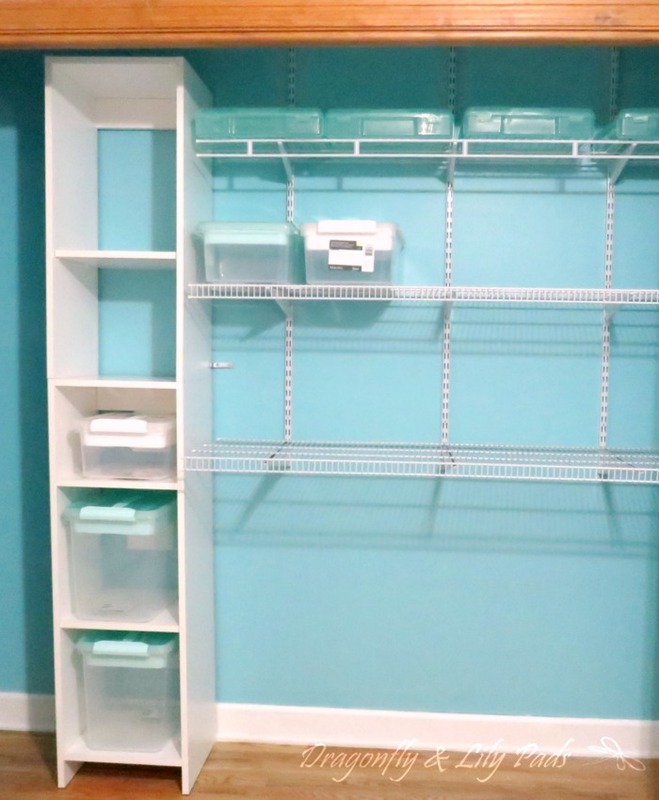 I still have plenty to fill my closet as I am typing this post my fingers are bleeding and covered in paint since the floor dried on Saturday night giving us one day to paint and load in My "FIRST" Craft room. I will be doing several more posts to keep you updated coming soon as I settle into my new space. I hope you loved this post as much as I did creating it. I have included a Pinterest image for you to save. 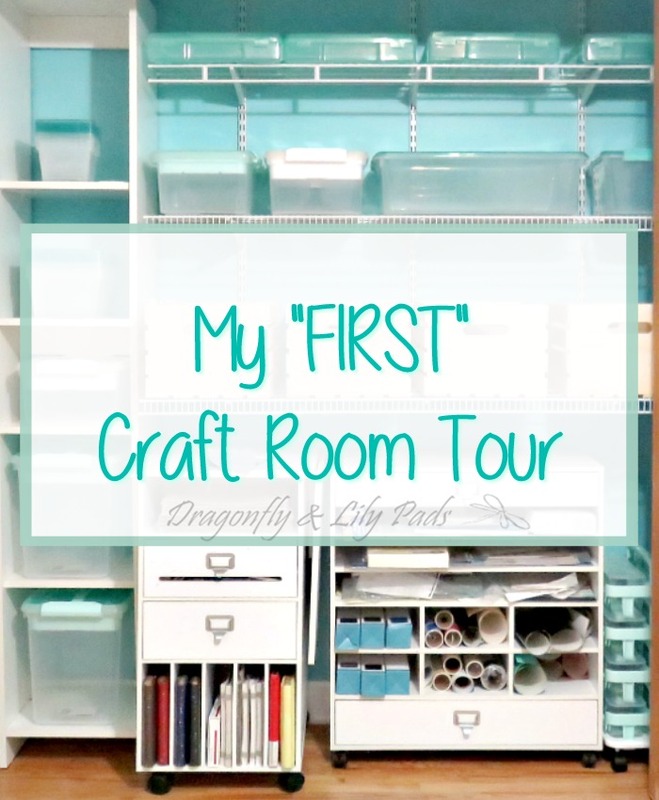 Your craft room is awesome! I love the color of the accent wall.